Time to Start Planting Peppers? Planting peppers is simple. The steps you take now will have a big effect on your pepper production. If you have 4-5 inch seedlings (either home grown or purchased), you're ready to put them in your garden. Click here if you need more information about pepper seeds and seedlings. Wait at least 2 weeks after the last expected frost in your geographic area before planting any peppers. They love hot weather and full sun and won't perform well if the soil is too cold. The fruit will be ready to pick in 65-130 days, depending on the variety of pepper. Peppers should be planted 24 inches apart. This will give the plant plenty of room to grow. It will also allow you good access to the plant to pick the peppers. This also allows enough room between plants to prevent the rapid spread of diseases. Pepper plants will develop a medium sized root ball. If pepper plants are grown too closely together, they will end up competing for valuable soil nutrients. Once you have enough space allocated for your pepper plants, it's time to get them in the ground. 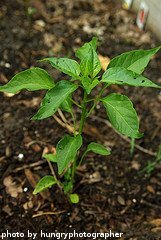 The first step in planting peppers is to dig a hole about 2 inches deeper than the seedling container is tall. Place about an inch of loose soil at the bottom of the hole. Carefully remove the pepper seedling from the seedling container. Be sure to remove the plant, root ball and soil. Place the plant in the hole and fill in the remaining space with garden soil. Make sure that the plant is straight up and down. The soil should cover the root ball and about an inch of the bottom part of the stem. Lightly tamp down the ground around the plant. Water the plant thoroughly, paying close attention to the base of the plant and the roots. Peppers planted with loose soil at the bottom of the hole will develop larger, stronger root systems. This will allow the plant to focus on fruit production later on. Hold off on fertilizing the plants at this stage. There should already be enough nutrients in the soil. With enough water and plenty of hot weather, the pepper plants should grow relatively quickly. You should also wait at least a week before before installing support stakes or cages. If you are planting peppers in a container garden, follow the same steps listed above. 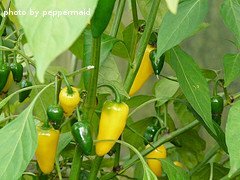 Pepper plants require at least a 3 gallon container for maximum fruit production.